BISSAU, Guinea-Bissau, June 8, 2018 /PRNewswire/ — American company, African Football Corp. (AFC) announced a new strategic alliance with the National Football Federation of the West African nation of Guinea-Bissau, promoting new opportunities within the country’s public and private sectors. This historic deal will mark the first time an African FIFA member Federation outsources its operations to an American firm specialized in the promotion and business development of sports teams. The partnership is expected to move the national team from its current 104th FIFA ranking to the Top 50 within a four-year period. The deal between African Football Corp. and the government from Guinea-Bissau will last 10 years, allowing the company ample time to curate and develop the country’s new team. The partnership will provide the Guinea-Bissau Federation with the private sourced funding required to operate and improve the team’s current global ranking. 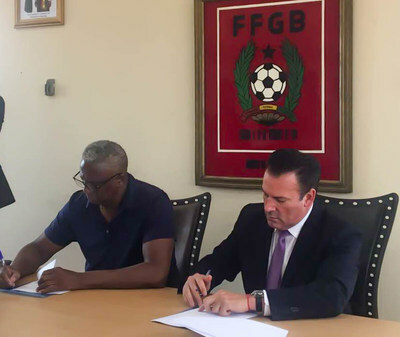 The agreement was made official with the signing of President of the Guinea-Bissau Football Federation, Manuel Irenio Lopes Nascimento and President CEO of African Football Corp., Oscar A. Faria. African Football Corp. will play an all-encompassing role in the team’s management, by acting as the federation’s commercial agent, business developer, and agent for the national team’s players. By overseeing the team’s operation, it will help the athletes achieve the best deals possible with top teams across Europe, the Americas, and Asia. As football fanatics worldwide prepare for the Russia 2018 World Cup, slated to begin on June 14, 2018, African Football Corp. will begin working with the local talent found in Guinea-Bissau to hopefully prepare them for the 2022 games. African Football Corp. is an American company lead by a multidisciplinary team from all walks of life with two things in common, business experience and passion for Football.